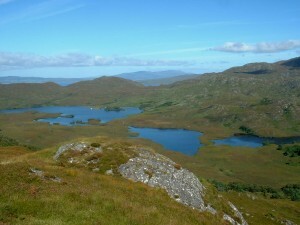 The zonal variation of the flora and invertebrates of Loch Morar influences the fish population, both in the species that are present as well as where to find them. Loch Morar’s fish population include the Atlantic Salmon (Salmo salar), brown trout/ sea trout (Salmo trutta), Arctic char (Salvelinus alpinus), eel (Anguilla Anguilla), stickleback (Gasterosteus aculeatus) and minnow (Phoxinus phoxinus). Amongst the trout population there is further diversity, about which little is known, but it is apparent that the trout vary in their colouration from one area of the loch to another, as well as in their feeding preferences. Not very much is known about the Highland’s Arctic Char populations, not least that of Loch Morar, which is recorded as being of National importance. In general char eat zooplankton and other small prey in the middle of the loch, distant from the places where they themselves may be preyed upon by the ferox brown trout that conserve their energy to eat predominantly only large prey items such as other trout as well as char and juvenile salmon.